With just three weeks to go, the countdown to Europe’s largest nuclear supply chain event is now under way. More than 1,000 delegates have so far registered to attend the NDA Estate Supply Chain Event 2014 in Manchester, on 6 November, and all 260 exhibition spaces are taken. Reserve spaces may still be available in the event that exhibitors are unable to take up their stands at the last minute, while the EventCity venue is large enough to accommodate further visitors. Among the exhibitors will be at least 40 of the estate’s largest Tier 2 contractors. A full list of all companies attending is available on the event website. 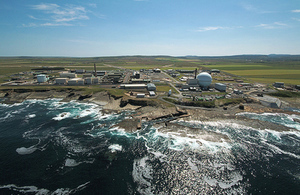 The showcase event, organised jointly by the Nuclear Decommissioning Authority and its Site Licence Companies (SLCs) is now in its fourth year, with a mission to increase the visibility of opportunities for existing supply chain companies as well as newcomers to the decommissioning sector, focusing in particular on Small and Medium Enterprises (SMEs). Last year’s keynote speaker Baroness Verma, Parliamentary Under-Secretary of State for the Department of Energy & Climate Change, returns to open the event, while further support comes from the Ministry of Defence, with a stand for the Defence Equipment and Support and Submarines Operating Centre, and a presentation by Rear Admiral Mike Wareham. Ron Gorham, the NDA’s Head of Supply Chain Optimisation and SME Champion, said the event had trebled in size since it was first launched and was now the largest of its kind in Europe. “The day is tailored to meet the aspirations of businesses at all levels of the supply chain, and encourage new suppliers to get involved. We are very conscious that the supply chain is vital to our mission, and we wish to ensure it remains healthy and dynamic,” he added. The theme of the event will be Connect and Collaborate. Following a series of presentations, it is expected that the main attraction will be the informal networking opportunities with a wide range of businesses and key figures from across the industry.